The first Soviet helicopter put in serial production - Mi-1 - was quickly modified to be able to perform as a military asset. In the late 1950s, the light attack helicopter Mi-1MU was assembled and equipped with either unguided missiles or machine guns. The Mi-1 was used in fighting in China between Mao's communist troops and the army of Chiang Kai-shek. It was also used by Egyptians and Syrians battling the Israeli army. The Mi-6 was originally designed as a troop-carrying helicopter in the late 1950s. It set a few world records in terms of weight lifting at a certain altitude. Some Mi-6s were equipped with a 12.7mm machine gun. In the Six-Day War in 1967, Egypt lost 10 Mi-6 helicopters destroyed by the Israelis on the ground. In the Afghanistan conflict in the 1980s, the Mi-6s were mainly involved in the transportation of ammunition. Nearly 30 such helicopters were lost. Mi-8 was designed as a military-logistics machine, and it has taken part in many military conflicts in the last 50 years, especially in the Middle East. This chopper's heyday came during the conflict in Afghanistan in the 1980s. Mi-8 took part in all the conflicts on the territory of the former Soviet Union in the 1990s and later. Mi-24 was the first proper Soviet military helicopter, and is believed to have participated in 30 local military conflicts. This is the only attack helicopter that can also be used for transporting troops in landing operations, and it has been used by the armies of 45 countries. The helicopter was well known during the conflict in Afghanistan, at which time it was nicknamed "crocodile" because of its characteristic shape. More than 120 Mi-24s were lost during the war in Afghanistan. In the conflict in Lebanon in 1982, a Syrian Mi-24 managed to shoot down an Israeli F-4. Ten years later a "crocodile" was able to destroy a Georgian Su-25 attack aircraft during the war in Abkhazia. The Kamov Ka-50 "Black Shark" is a single-seat attack helicopter with a coaxial configuration of two rotors, making it a powerful chopper. It's the world's first operational helicopter with a rescue ejection system. The helicopter was produced until 2009, and no more than 20 were made because the army opted for the further development of the Ka-50 - Ka-52 "Alligator." The "Black Shark" was used during the second war in Chechnya in early 2001. 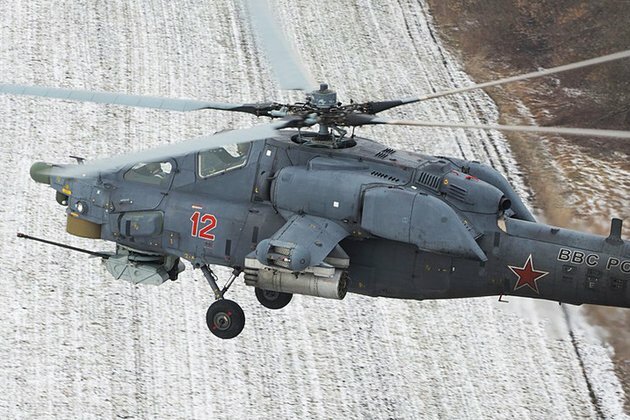 According to media reports, the Ka-50 surprised the pilots of the Mi-24 during their joint missions because they could not easily identify the location of the "Black Sharks" during combat due to the extraordinary maneuvering skills of the Kamov choppers. Russia's latest attack helicopter, which is produced by the Mil design bureau, is the Mi-28N, "Night Hunter". It's an all-weather, day-night two seat copter. In 2016, they were deployed in Syria, and during the Battle of Palmyra in April 2016, several Mi-28Ns supported the Syrian government troops in the assault on the city.